And that’s just one of dozens of poisonous products your pets may encounter in a typical day. The fact is, our homes are filled with products that are not meant to be eaten, or that are okay for humans but dangerous for dogs and cats. Xylitol is a good example, as is chocolate. 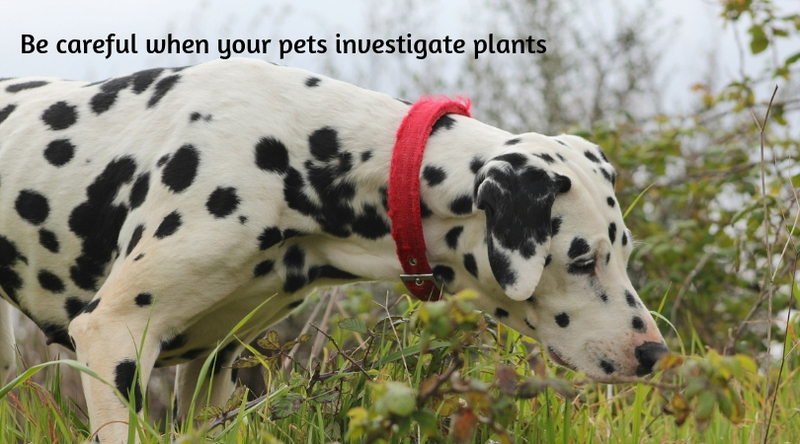 There are even common houseplants that can be dangerous if ingested. The third full week of March is always recognized as National Poison Prevention Week, making this month a good time to review your home (and purse) for possible toxins. This includes considering dog or cat access to potential toxins. As you can see, there are lots of common products that can be dangerous to your dog or cat. Here’s a short list of things to evaluate, especially if you have a curious pet. Bleach and Other Household Cleaning Products - Many of these products can cause renal failure and even death if your pet drinks them. It’s a good idea to keep them behind a locked door to prevent prying paws. Anti-freeze – Believed to have a sweet taste, this common substance is also dangerous if ingested. As with any cleaning product, it’s a good idea to keep it locked up and out of reach of curious animals. Rodent or Bug Poison (or Spray) – Ant traps, bug spray, rat poison, rodents who have ingested poison: each of these poses dangers to your pet and you’ll want to keep them securely stored out of pet reach. Certain Foods – Chocolate isn’t the only common food item that’s dangerous to dogs and cats. Onions, macadamia nuts, and even grapes can cause vomiting and sometimes severe gastrointestinal problems. ASPCA Animal Poison Control lists even more no-no foods here. Plants – There are hundreds of common houseplants that can be toxic if eaten. Azaleas, tulips, sago palms, and more are featured on ASPCA Pet Poison Control's list of poisonous plants. Even certain types of mulch (like so-called “chocolate mulch”) can be a serious problem for dogs. 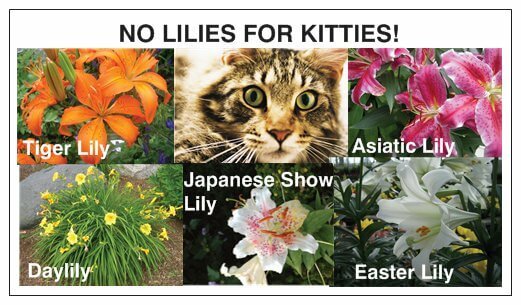 If you have cats, you need to be absolutely certain to keep them away from lilies (all kinds), as they are deadly. The flowers, leaves, pollen - even the vase water - of lilies can kill a cat, causing acute kidney failure. As you can see, there are many everyday items that can be problematic to your pets. The key is to pet-proof your home, especially if you’re bringing home a new animal. Store all medications, cleaning products, and chemicals in secure cabinets or other locations. And don't forget to simply keep your pets away from certain foods and plants. In some cases, young or “new-to-you” pets may be most at risk because they’re curious and tend to taste everything. But even older animals have been known to do things like eat a pack of sugarless gum from your purse. 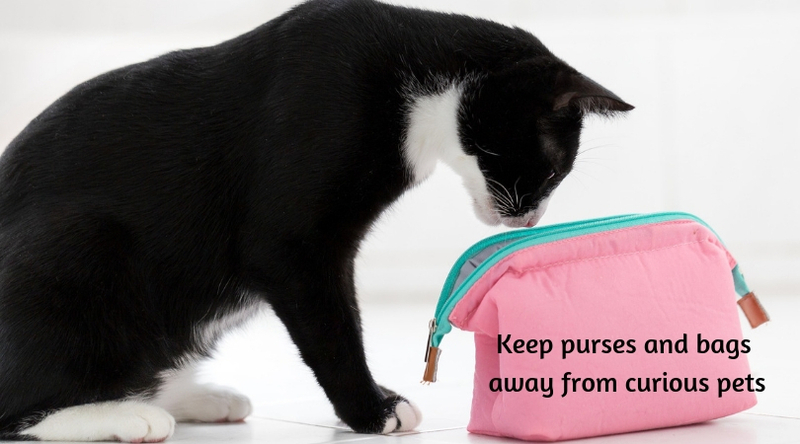 To play it safe, keep purses and bags away from your pets and at least once a year, re-evaluate your home and garage for safety. Has anything been left within reach of Max? If so, put it away. If you do have a situation where your pet ingests toxins, call your veterinarian right away and they can advise you of what to do next. You can also contact the ASPCA Animal Poison Control Center (APCC) hotline at (888) 426-4435 or the Pet Poison Helpline at (855) 764-7661. When did you last evaluate your home for potential pet dangers? If you have any questions about what you can do to protect your specifc pup or kitty, please feel free to contact us!